Researchers at the Nicholas School of the Environment at Duke University have written an article published in the Proceedings of the National Academy of Sciences titled “Methane contamination of drinking water accompanying gas-well drilling and hydraulic fracturing,” which finds “systematic evidence for methane contamination of drinking water associated with shale-gas extraction” in the Marcellus Shale in Pennsylvania and New York. The article has already elicited a strong response from the industry. To my knowledge, this is the first scientifically based study finding a correllation between the drilling of shale wells and the contamination of aquifers. The authors analyzed groundwater taken from 68 private water wells. The wells were divided between those located more than one kilometer from a gas well and those located less than one kilometer from a gas well. The article does not further describe the gas wells – whether they are Marcellus wells, when they were drilled, or what companies operate the wells. The authors analyzed the groundwater in three ways: to measure dissolved concentrations of methane and higher-chain hydrocarbons, carbon and hydrogen isotope ratios of methane, and dissolved salts. The authors state that methane was found in 51 of the 60 wells sampled for methane. Energy In Depth, an industry lobby association, has already criticized the study. “It’s amazing these guys are this comfortable making these kinds of conclusions with a data set this small, no random sampling, and no baseline information to speak of whatsoever,” said Chris Tucker, a spokesman for Energy in Depth, in a statement. “There are important aspects of the study that Range and others consider questionable or incomplete. We intend to reach out to the researchers and provide them additional information to help fill in the gaps. Despite its short-comings, the Duke study raises awareness on an important issue that Range spearheaded and worked on with the Pennsylvania DEP over the last several years regarding natural gas migration. We know the geology is unique in northeast Pennsylvania. Naturally occurring gas migration has been a documented issue in this part of the country for decades. 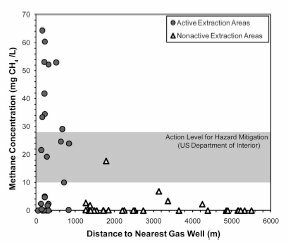 In northeast Pennsylvania improperly designed or constructed natural gas wells may cause or increase naturally migrating gas. As a result, earlier this year Pennsylvania instituted strengthened regulations and standards that focus on well design and construction, among other enhancements, that address this issue head on. This was an initiative that Range led and supported in Pennsylvania, along with other responsible companies and stakeholders. These new well design and construction regulations are now law and all companies operating in Pennsylvania are required to follow them. Pennsylvania now has among the best standards and regulations for natural gas well design and construction in the nation. “The Duke study further demonstrates hydraulic fracturing has not impacted ground water, a point mentioned several times by the authors and supported by the fact they found no fracturing fluids in any of the water they sampled.